Summary: Researchers report finger configurations used in children for counting and communicating numeric information are associated with number representation in the brain. Additionally, this association can be observed during adulthood. By the time children begin walking and talking, they’re accustomed to using their fingers to point, grab and even brace for a fall. 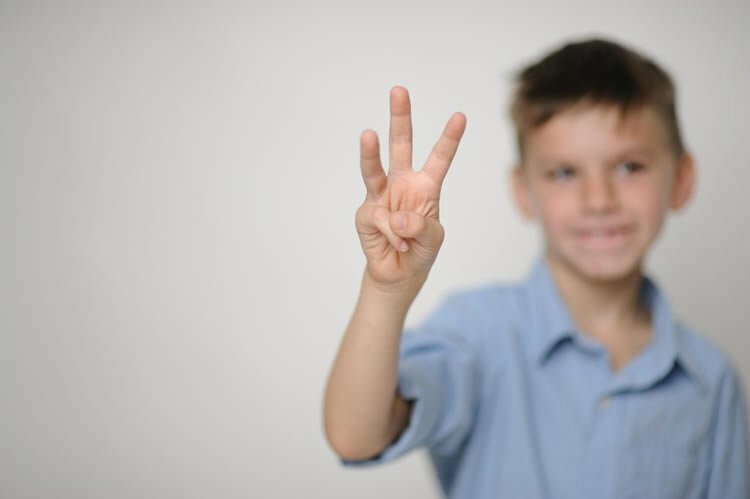 Children also use their fingers for numerical representation and counting, a common practice for teaching and learning simple arithmetic, such as addition and subtraction. While children likely won’t rely on finger counting much past the second grade, the practice has evolutionary and neural backgrounds that could have implications for understanding a child’s aptitude for math, according to Dr. Firat Soylu, an educational neuroscientist at The University of Alabama. Soylu is interested in exploring embodied cognition – the relationship between the body and mind and how the body is related to learning and thinking. Soylu began studying the neural processes of numerical cognition and how we use bodily systems to learn math while deciding on a dissertation topic at Indiana University. Soylu is exploring these relationships through campus’ Embodied Learning Design and Educational Neuroscience Lab, or ELDEN, and through collaborative studies across the country. He is examining the relationship between finger sensorimotor development and numerical development and the implications of this research for mathematics education. He’s also collaborated on a fMRI, or Functional Magnetic Resonance Imaging, study with the Cognitive Neuroimaging Lab at Indiana University that looks at the neural and behavioral relations between finger sense and arithmetic ability in children ages 7 and 8. Finger sense, or the ability to distinguish between fingers, is a common test for neuropsychological disorders. The test can be as simple as closing your eyes and naming the finger that has been touched, or more complicated, like using the fingers on the right hand to repeat a pattern of someone touching fingers on the left hand. Young children struggle with this task because their sensory motor skills aren’t fully learned and refined. Studies have shown finger sense either correlates or predicts math ability, but the results, particularly in behavioral associations, are conflicting, Soylu said. An fMRI is a specialized brain scan of neural activity that could fill gaps in the literature and point researchers in new directions, even if it doesn’t provide a clear causal measure. Soylu and colleagues studied the relationship between finger sense and two arithmetic operations – addition and subtraction – through fMRI scans of 24 second and third grade students. The results showed finger sense scores in three clusters of the brain were negatively correlated with brain activity for both addition and subtraction, showing kids with high finger sense scores had lower activation in these areas. This might be from more efficient functioning of a more developed finger sensorimotor system, which overlaps with the network responsible for arithmetic. Activation in another cluster negatively correlated for only addition, even though it was active for both math tasks. This shows the association of the finger sensorimotor system and addition goes deeper, compared to subtraction, possibly because more intensive finger counting experiences with addition compared to subtraction. The study supported the hypothesis that fingers provide a necessary scaffold for calculation. The researchers assumed mathematics memories for addition and subtraction encode differently because of differences in learning experiences, he said. In a recently completed study focusing on how adult participants processed number gestures in his lab, Soylu found evidence for a specific association between conventional finger gestures to represent numbers and numerical magnitude representation in the brain. The study provides further evidence finger configurations used for communicating number information and counting are associated with number representation in the brain. Further, the study showed the effects of these associations can be observed in adulthood. To further understand the role of spatial processing in arithmetic, Soylu is collaborating on another fMRI study on how different types of play can affect arithmetic processing, like using blocks to develop visuospatial abilities. A children’s first relationship with math is often their fingers. NeuroscienceNews.com image is adapted from the AGS news release..
Educational neuroscience is a relatively new and slowly emerging field. While the goal is to impact how math is taught, more scientific evidence is needed before diagnostic tools can be formed. Soylu said while the driving goal is to be skilled enough to not rely on physical interaction to perform math tasks, it is necessary to go through the stages of physical interaction to enhance math ability. Thus, parents should think about how early interactions during development might affect later cognitive development. Dr. Soylu is an assistant professor of educational psychology and education neuroscience. He is a coauthor on a paper for the Journal of Numerical Cognition that covers some of the research mentioned, with other papers pending. Image Source: NeuroscienceNews.com image is adapted from the AGS news release. Original Research: Open access research for”The Differential Relationship Between Finger Gnosis, and Addition and Subtraction: An fMRI Study” by Firat Soylu, David Raymond, Arianna Gutierrez, and Sharlene D. Newman in Journal of the American Geriatrics Society. Published online January 30 2018. University of Alabama “This Many: Unlocking the Relationship Between Math Ability and Fingers.” NeuroscienceNews. NeuroscienceNews, 25 March 2018. University of Alabama “This Many: Unlocking the Relationship Between Math Ability and Fingers.” http://neurosciencenews.com/math-fingers-8682/ (accessed March 25, 2018). Feel free to share this University of Alabama.